mxQueue™ is a Python extension package that provides a new object type called Queue. It works much like what you would expect from such a type, having .push() and .pop() methods and focusses on obtaining maximum speed at low memory costs. mxQueue is written in a very portable way and works on pretty much all platforms where you can compile Python. 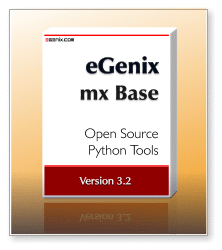 mxQueue is provided as part of the eGenix.com mx Base Distribution. Please see the mx Base Distribution page for details regarding the license. The PDF file is also available as part of the installation and can be found in the mx/Queue/Doc/ folder. mxQueue is provided as part of the eGenix.com mx Base Distribution. Please see the mx Base Distribution page for downloads and installation instructions. mxQueue was written for the eGenix.com Application Server.